Following drastic shifts in the spatial organization of goods production, increasingly fierce competition now forces firms also to look critically at how to organize the production of services. While digitization and advances in information and communication technologies have enabled firms to unbundle service production processes, the increased global availability of skilled labour allows for the relocation of ever more of these processes around the world. As a result, a new geography of services production takes shape: a geography that is defined by new interregional and international divisions of labour and held together by increasingly complex global services production networks. This book examines how the reorganisation of services production alters relations between and generates different sets of challenges and opportunities for economic development in the Global North and the Global South. Drawing from 11 case studies probing various aspects of services production in different parts of the world, the book brings out the remarkable heterogeneity and transformative capacities of services. 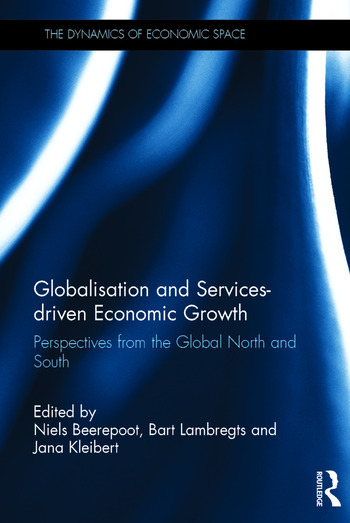 It successively shows how global trade in services creates new interdependencies between services producing and services consuming regions; reveals how services help to mitigate the impact of and contribute to recovery from economic crises in the Global North; and demonstrates how services offshoring fosters economic development and service-sector driven modernisation processes in the Global South. The book’s openness to the heterogeneous and dynamic nature of services production enlarges our understanding of which particular services in which spatiotemporal context have the capacity to generate good jobs, contribute to productivity and drive economic growth. The book stands out from other books in the field in that it combines perspectives on services-driven transformations from both the Global North and the Global South and looks into the role of various services segments. Based on pioneering empirical research and original data it offers a timely contribution to this growing debate. The book provides valuable insights for students, scholars and professionals interested in services, services offshoring, services-driven growth, and socioeconomic transformations in the Global North and South. 10. Changing Geographies of Services – The case of South Africa: towards Regional Value Chains? Niels Beerepoot is Assistant Professor in Economic Geography at the University of Amsterdam, the Netherlands. Bart Lambregts is post-doc researcher at the Amsterdam Institute for Social Science Research (AISSR) of the University of Amsterdam, the Netherlands. He lectures on urban planning at the Faculty of Architecture of Kasetsart University in Bangkok, Thailand. Jana Kleibert is post-doc researcher at the Leibniz Institute for Research on Society and Space (IRS) in Erkner, Germany, and is honorary research fellow at the School of Environment, Education and Development at the University of Manchester, UK.